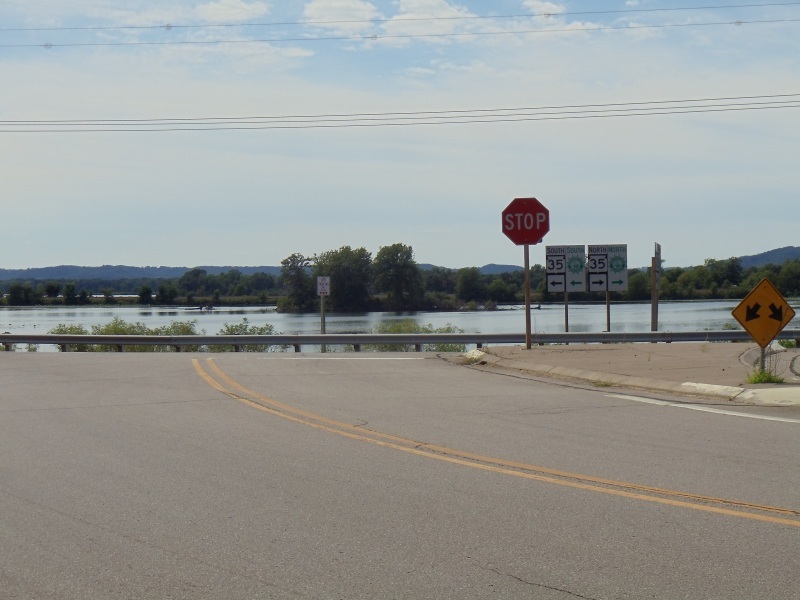 Quickie Summary: State “Trunk” Highway 37 connects Eau Claire with the Mississippi River at Alma, following the Buffalo River much of the way. 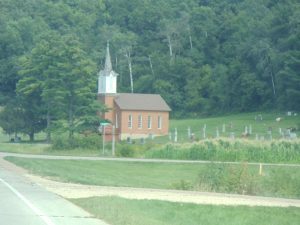 A nice tour through the northern part of the “Driftless Area”, it’s a pretty easy (and pretty) drive with plenty of curves, views and nature to make it a good “get away from it all” drive. The Drive (South to North): Highway 37 begins at Highway 35, the Great River Road, just north of Alma (pop. 942). 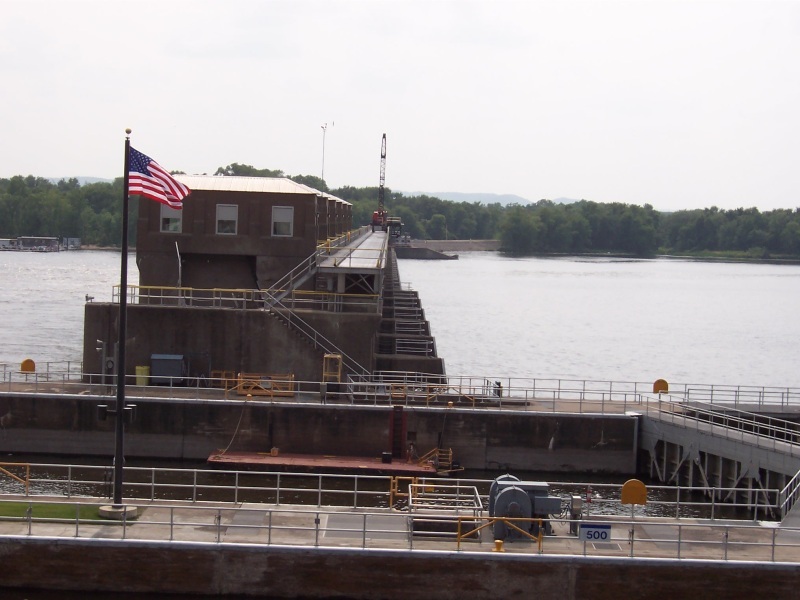 Established in 1848, the same year Wisconsin became a state, Alma’s motto is “Step into living history.” Alma offers probably the best views of locks in action with a towering observation deck close to and above Lock & Dam No. 4. 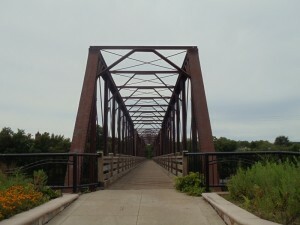 The metal bridge that serves as the observation platform spans the railroad tracks that line the Mississippi, which makes it all the wilder experience when a massive train rumbles underneath your feet. It’s also a popular nesting place for bald eagles. The Wings Over Alma Nature & Art Center is a great place to find out more about the bird migratory patterns, the natural wonders of the area, and to check out the works of local artists – this whole area, actually, draws artists from all over. Below: This view of Alma, the bluffs above the town, the tracks where trains rumble up and down the Mississippi – in this case, under your feet – and the close-up view of Lock & Dam No. 4 (next picture down) can all be had from the observation deck. 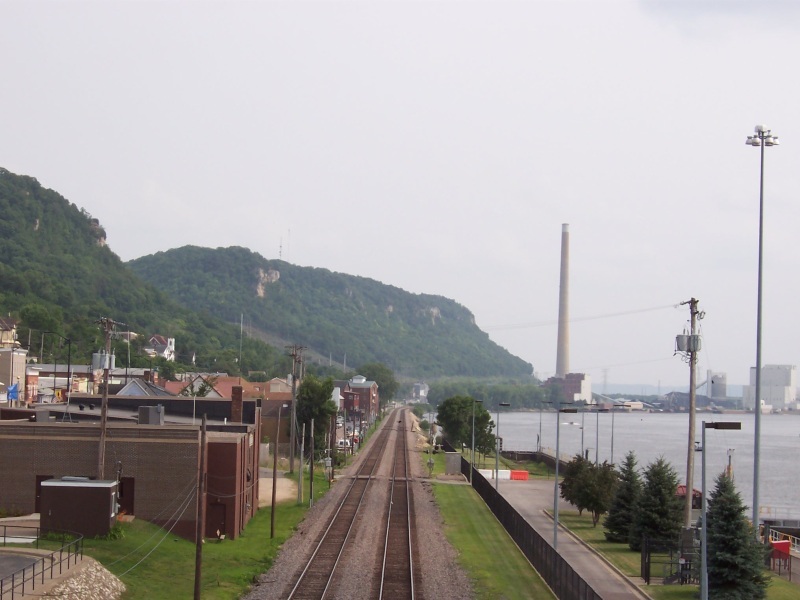 The train tracks were completed from La Crosse to St. Paul in 1886; Lock & Dam No. 4 opened in 1935. 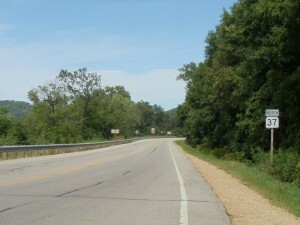 Highway 37 begins just north of here off Highway 35. Highway 37 begins just north of all this lock and river action along Highway 35 and heads up into the bluffs, with plenty of curves and winding road to make it fun and interesting. Approaching the start of Highway 37, you’re enjoying the Great River Road with its majestic bluffs and scenic river views along Highway 35. The start of Highway 37 just north of Alma already hints at the winding sections you’re about to enjoy. The last curve southbound on Highway 37, letting you know your ride from Eau Claire on 37 is about to end. 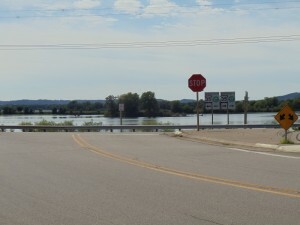 Highway 37 southbound ends at Highway 35 and the Great River Road right along the Mississippi waters, with Alma laying just to the south. Most of what you’ll see along Highway 37 isn’t even man-made; the beauty of the natural landscape pretty much takes care of your sightseeing needs. The highways twists and turns its way up from the Mississippi. 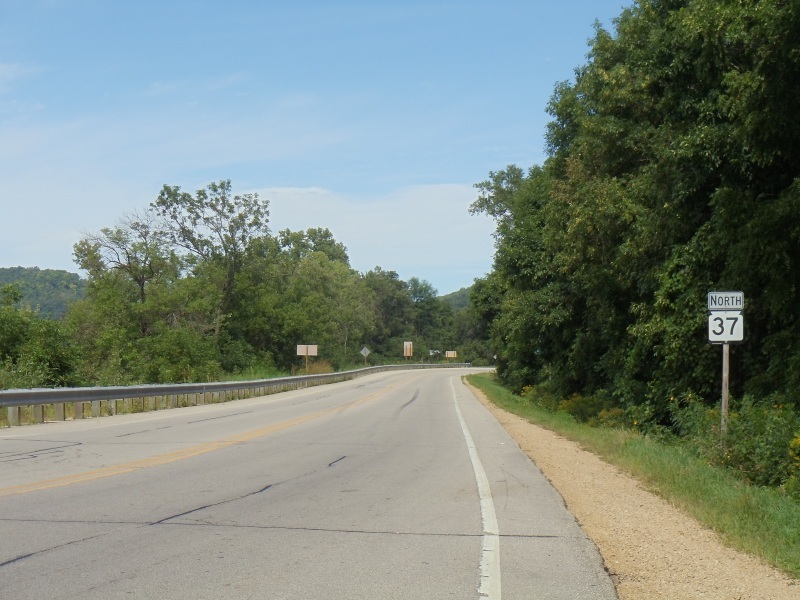 Bluffs are frequent at the start, but the land stays rolling and forested much of the way to Mondovi. Fall colors are especially brilliant on this stretch, making it popular for motorcyclists. There aren’t too many things in general – other than tight curves – to slow you down on Highway 37. This church and cemetery, nestled into a hill along Highway 37 a few miles from the Mississippi River, is just part of the lovely scenery along this stretch. 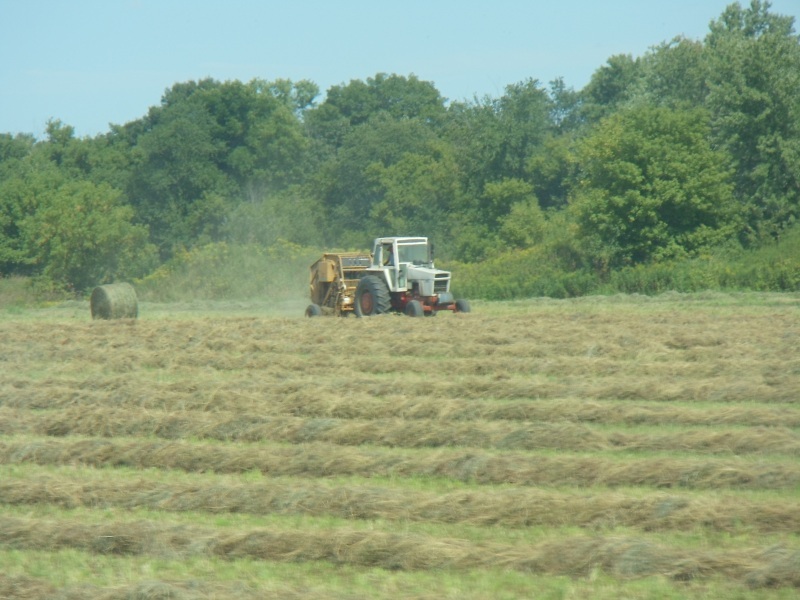 Where the land is flat enough to farm, productive farms abound in this region (after all drainage is pretty good!) This farm is along Highway 37 just south of the junction with Highway 88. 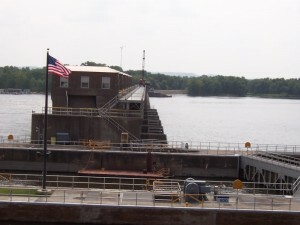 After a junction with Highway 88, which back towards the Mississippi in a southwesterly course, Highway 37 reachs Mondovi (pop. 2,634), the only sizable town along the route other than Eau Claire, and pretty much the “halfway point” on the route. 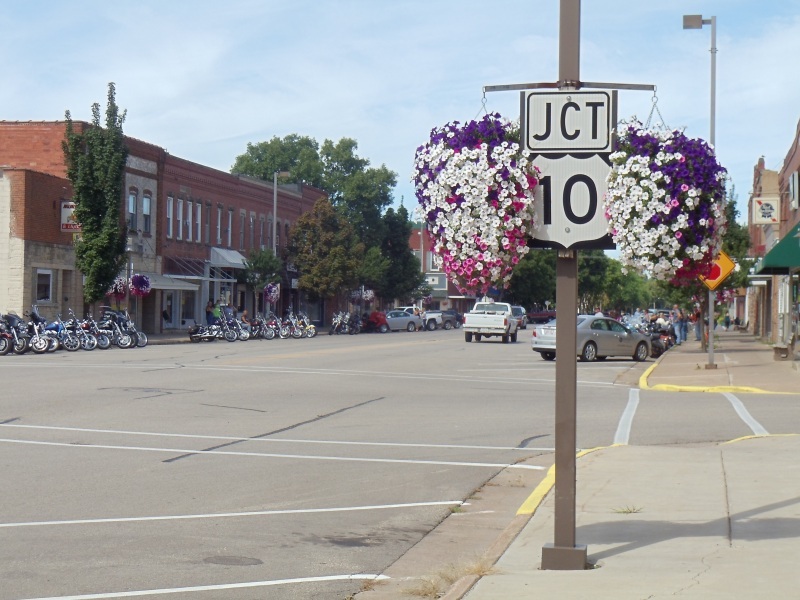 Mondovi is the county seat of Buffalo County and features several popular watering establishments for bikers (both kinds). Mondovi also features three museums in its “Tourist Park”: the School House Museum, a former one-room schoolhouse that has been restored (ironically, it’s only open on Sundays, when all non-religous schools were always closed); the Old Machinery Museum, which as you might guess boasts a historic collection of old machinery; and the City Hall Museum, which showcases the area’s local history. The Mondovi Historical Society website has more details on all of them. For bicyclists, ATV’ers and cross-country skiers, Mondovi is a trailhead point for the Buffalo River State Trail, which runs 36 miles to Fairchild. Even “Junction” signs are pretty in Mondovi… when the flowers are blooming. 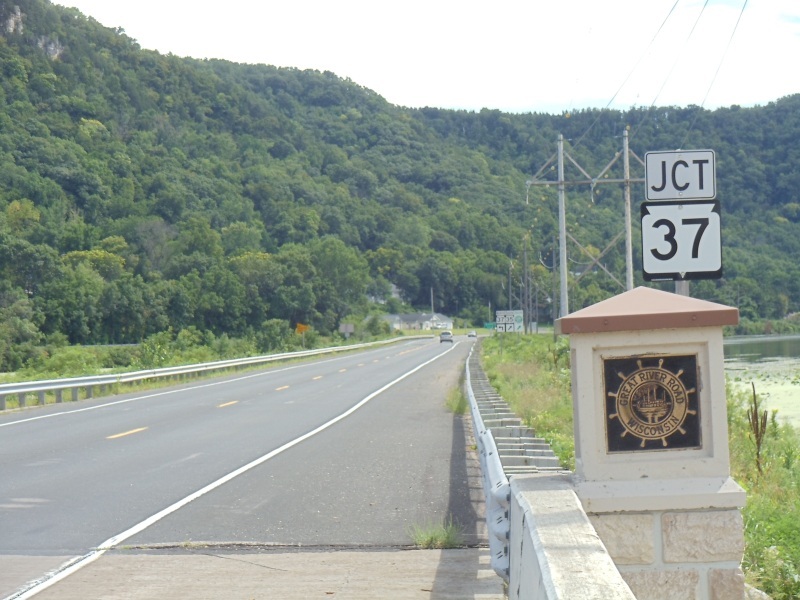 As noted here, Highway 37 meets U.S. 10 in Mondovi. 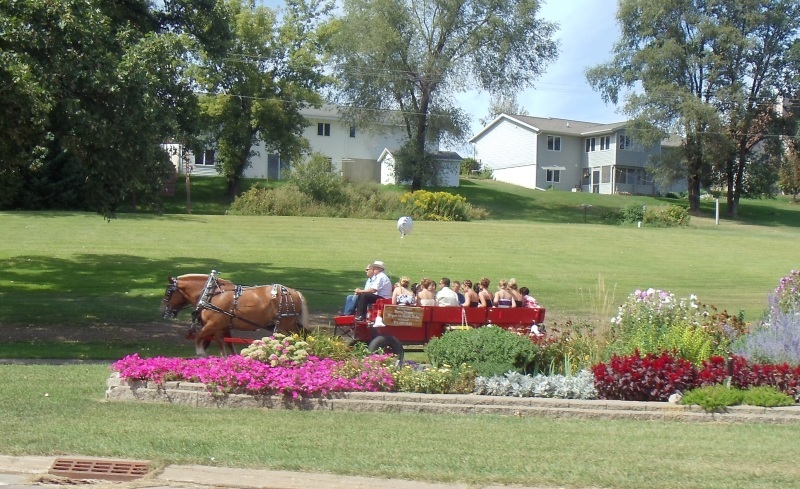 Spotted where Highway 37 leaves U.S. 10 and begins its trek north to Eau Claire, this horse-drawn wagon is filled with people enjoying a beautiful summer afternoon in Mondovi. 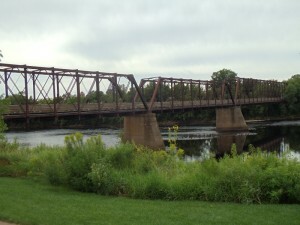 From Mondovi, it’s a fairly short drive to the “big city”: Eau Claire (pop. 65,883). 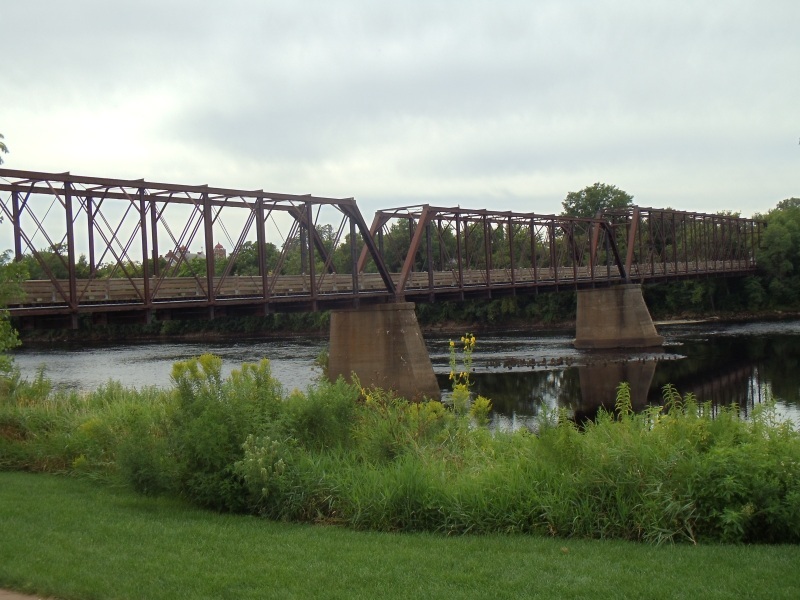 The largest city in northwestern Wisconsin and the ninth-largest in the state, it was founded at the confluence of the Chippewa and Eau Claire Rivers. 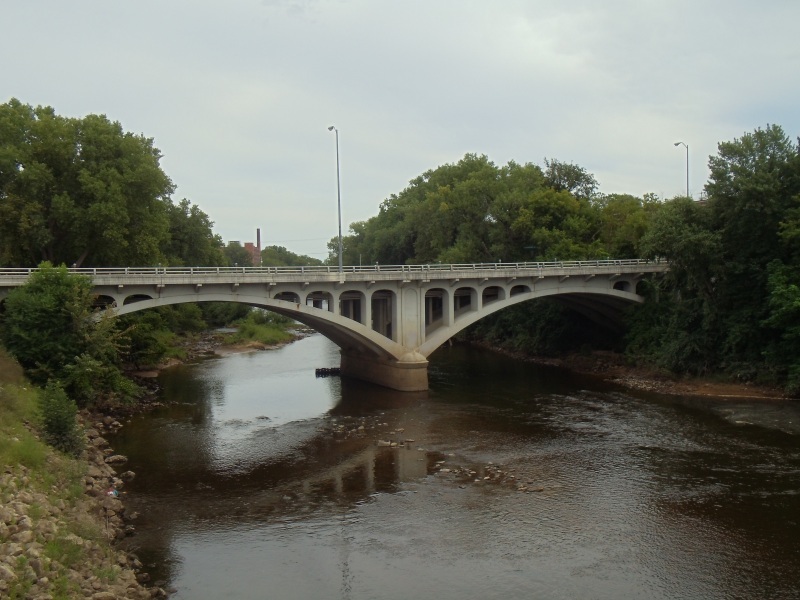 Eau Claire was named after early French explorers’ declaration of “voici d’eau claire!” (“here is clear water!”) and the city’s ties to its water resources have been tight ever since. 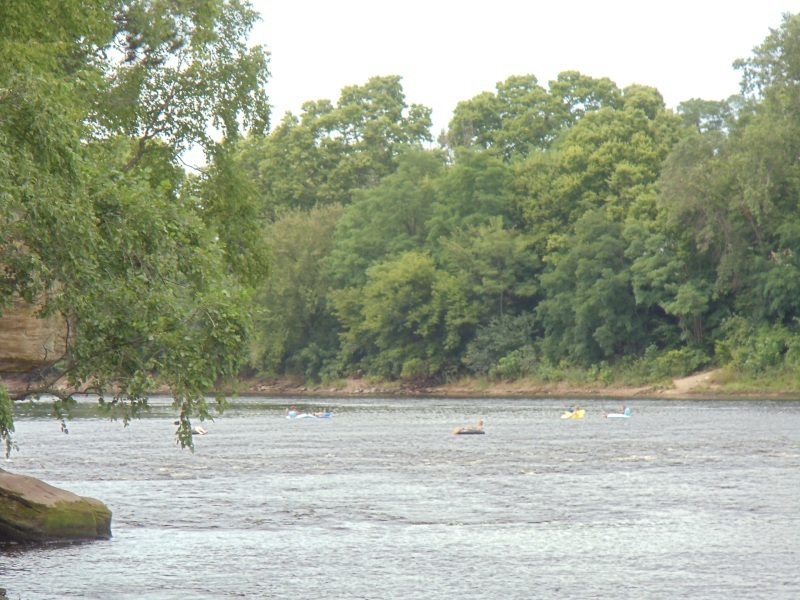 The movement of the water gave rise to as many as 22 sawmills that operated in the city in the late 1800s; however, the rivers also run lazy enough to allow for recreational tubing by thousands of UW-Eau Claire students during the summer months. 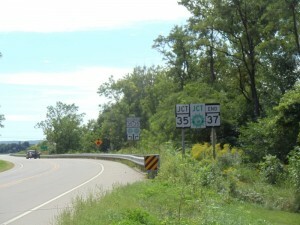 Highway 37 ends at U.S. 12 (Claremont Avenue), which skirts Eau Claire to the south and west. Going straight ahead, you can follow what used to be Highway 37 heading into downtown Eau Claire. 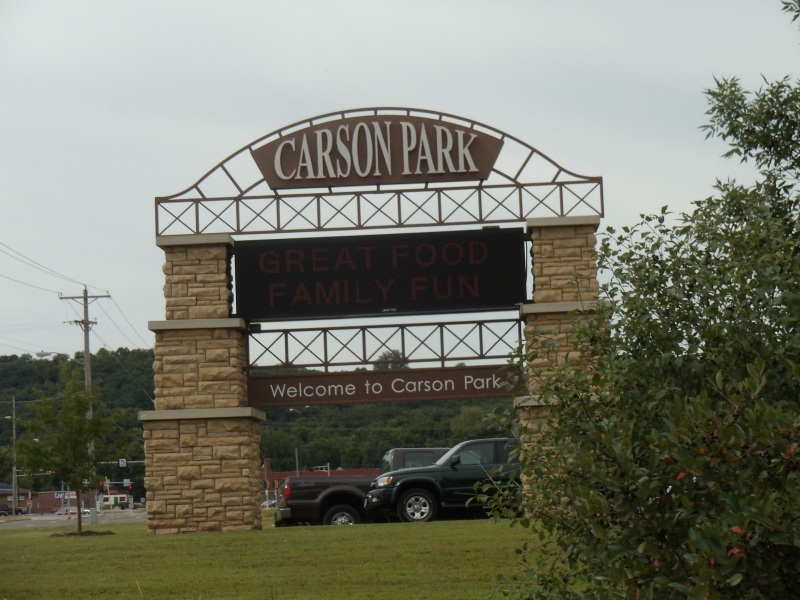 A major feature in Eau Claire is Carson Park. 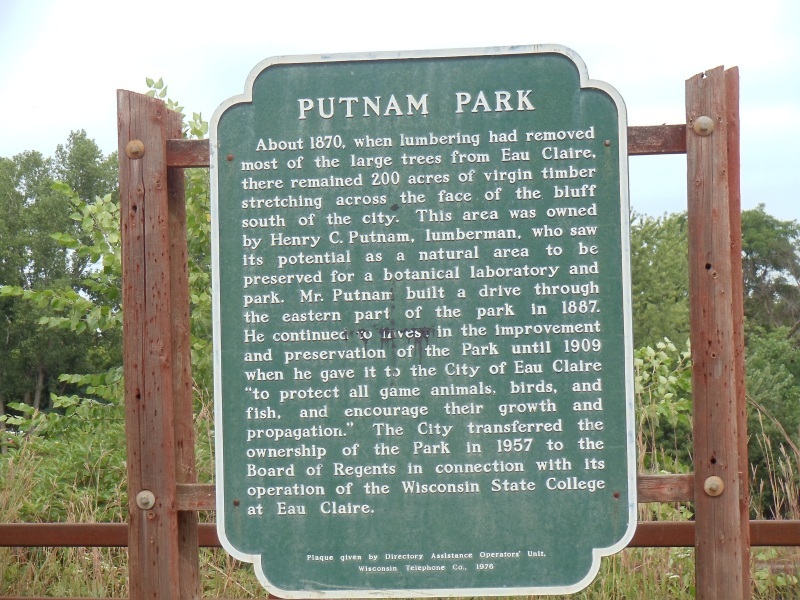 Situated on a peninsula formed by an oxbow in the Chippewa River, the 134-acre park features stadiums, festivals, trains, museums, lakes, and probably even some playground equipment. The Paul Bunyan Logging Camp Museum focuses on logging in the 1890s. It opened in 1934 and features a theater show, a blacksmith shop, cook shanty, bunkhouse and more. The Big Cut Room explores logging’s impact. You can check it out from May through September. The Chippewa Valley Museum (715-834-7871) is next door and features a variety of exhibits, including a 1950s era ice cream parlor if the kids (or you) need a treat. A ride on the Carson Park Train is also fun for everyone; you wind amidst the pine trees and enjoy the steam and sounds of an old-school engine. 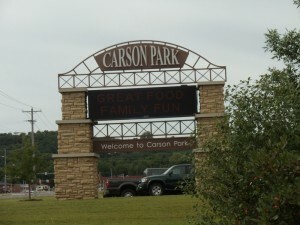 Carson Park also holds the Carson Park stadium, home of today’s Eau Claire Express, of the Northwoods League. Pro baseball dates back to 1937 in Carson Park, when the team was the Eau Claire Bears. Not wishing to be associated with a certain Chicago football team, they became the Eau Claire Braves in 1954 (okay, it was because they became a minor leage affiliate of the new Milwaukee Braves.) The Braves experienced significant success and local fans got to enjoy the careers of such major future players, managers, and sportscasters as Bob Uecker, Joe Torre, and Hank Aaron. 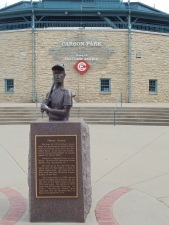 Aaron had a statue of him dedicated in 1994 that commemorated forty years since he’d played there, and all of the home run awesomeness that was to follow. The Braves departed around when the Milwaukee Braves moved to Atlanta, but the Express came aboard in 2005 and continue to display future MLB players. An entrance to Carson Park, a little west of where Highway 93 officially ends. 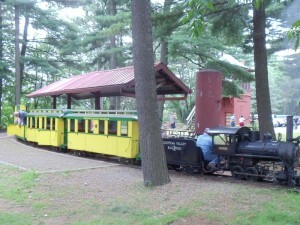 The Carson Park Train takes passengers on a half-mile ride through the pines, a trip that delights young and old alike. Hank Aaron rose up through the minor leagues in Eau Claire, debuting as a pro with the Eau Claire Bears in 1952. After two years playing right here in Carson Park, he would join the Milwaukee Braves and work his way into the top echelons of baseball history, eventually retiring as baseball’s home run king in 1976 – with the Milwaukee Brewers. 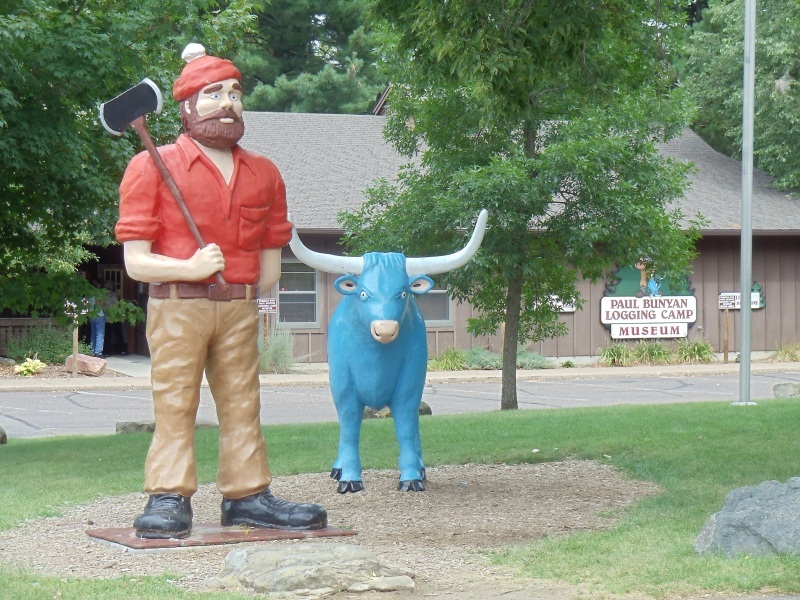 Carson Park also features the Paul Bunyan Logging Camp Museum…the exterior figures here make it pretty obvious. The Chippewa Valley Museum is next door; plenty of other attractions adorn Carson Park. 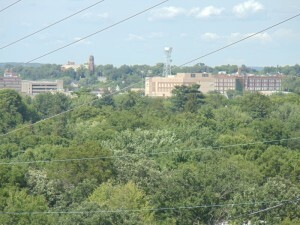 Eau Claire holds one of the state’s largest four-year universities, the University of Wisconsin-Eau Claire. With over 10,500 students studying, partying, and otherwise sluffing off across a 333-acre campus spanning the Chippewa River, it’s lively and considered one of the state’s most beautiful. U.S. News & World Report ranked UW-Eau Claire the 5th best regional university in the Midwest among all public colleges. 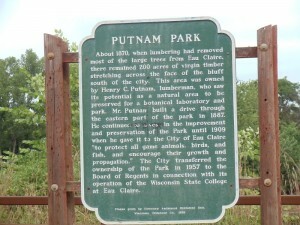 The campus features the James Newman Clark Bird Museum, among other facilities. The campus is divided into upper and lower portions, nestled in hills on either side of the Chippewa River. In summer months, tubing and floating on the river is a popular pastime. Eau Claire’s main employers and headquarters companies include Menard’s, Erbert & Gerbert’s Sandwich Shops, IDEXX Computer Systems, Cascades Tissue Group, National Presto Industries, and Open-Silicon. Computer hardware has become a major manufacturing segment in Eau Claire; for years, a Uniroyal tire plant provided much of the manufacturing employment. Times change. 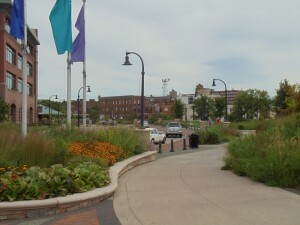 Eau Claire’s downtown holds plenty of great buildings, parks, bars and restaurants, and historical structures. The Children’s Museum of Eau Claire (220 S. Barstow Street, 715-832-5437) offers plenty of activities for little ones, while places to eat, drink, catch up on the games, listen to bands, see the arts and more downtown can be found at places like The Acoustic Cafe (505 S. Barstow Street, 715-832-9090), Pioneer Tavern (401 Water Street, 715-832-4455), the Eau Claire Fire House (202 Gibson Street, 715-514-0406), Mogie’s Pub & Grill (436 Water Street, 715-836-9666), and Stella Blues (306 E. Madison Street, 715-855-7777). 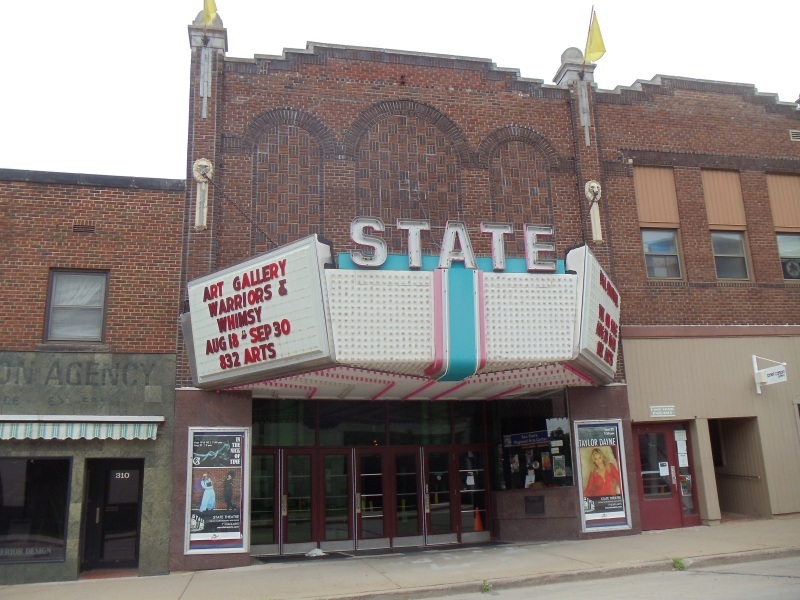 The State Theatre opened as a Vaudeville theatre in 1926, and today serves as the Eau Claire Regional Arts Center. Murals, bridges, and pathways adorn the downtown area, which has bene undergoing major revitalization. 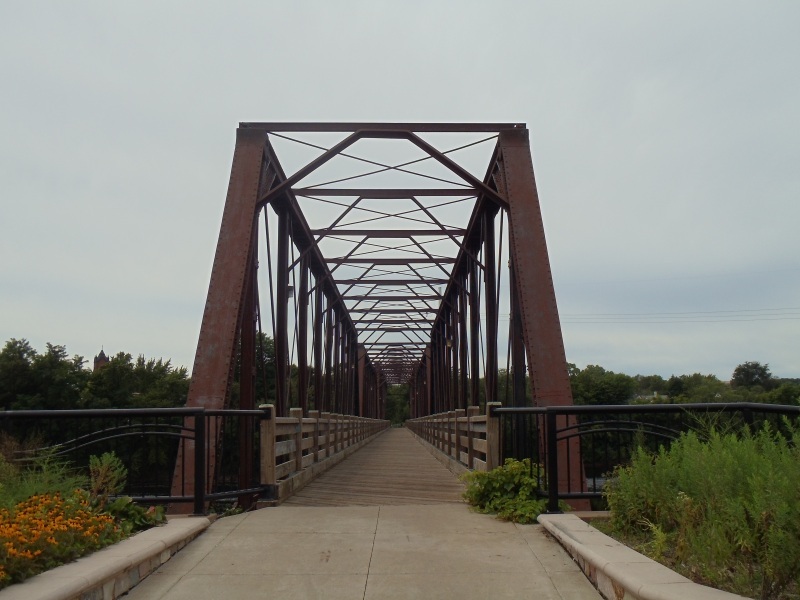 The Chippewa River State Trail crosses the Chippewa River downtown and offers recreational walking, hiking, biking, and snowmobiling on a former railroad line, which is why the bridge trestles look as they do. One of the most popular summer activities – especially for local college students – is to float down the Eau Claire and Chippewa Rivers. Find out more about things to see and do in Eau Claire by visiting VisitEauClaire.com. So, where does one go from here? 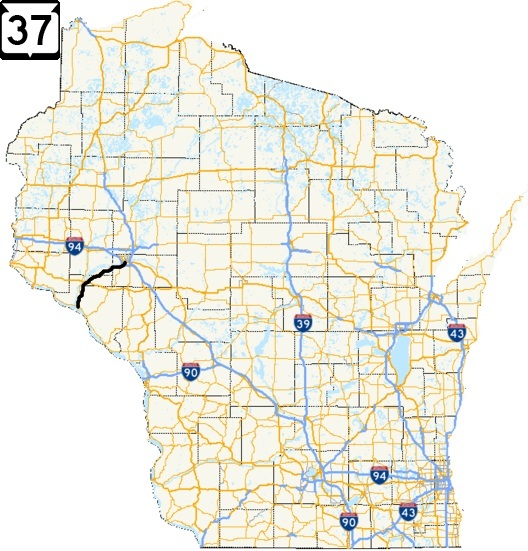 You can head east or west on U.S. 12, which will take you towards Menomonie, Hudson and Minnesota, or east back towards Black River Falls, Tomah, the Dells and Madison. 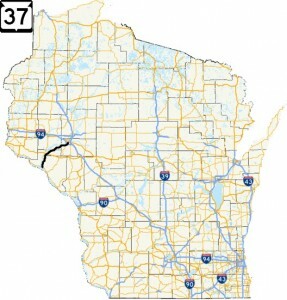 You could follow U.S. 53 north to Spooner and Superior or U.S. 53 or Highway 93 south to La Crosse. You could jump up to Chippewa Falls and enjoy the Leinenkugel Brewery Tour and then take Highway 29 east to Wausau and Green Bay. Or, just hang in Eau Claire for a while. 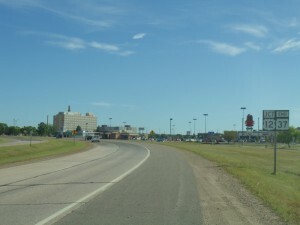 The Best Western PLUS Trail Lodge Hotel & Suites is within eyeshot of Highway 37’s northern end. Enjoy! 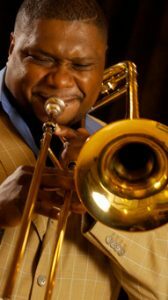 The Eau Claire Jazz Festival, presented by Eau Claire Jazz, Inc. in partnership with UW-Eau Claire, features jazz music from university groups on campus and nationally-renown guest performances Friday and Saturday evening April 26th & 27th, with a special Thursday night concert the 25th led by Chris Botti! Friday night the 26th will feature Guest Artists Grace Kelly & The New York Voices. Afterwards, you can enjoy the Airmen of Note, the premiere jazz ensemble of the United States Air Force (and one of the six ensembles that form the Air Force Band.) Based in Washington DC, the Airmen of Note formed in 1950 as a continuation of the military dance band tradition started by Major Glenn Miller, the legendary bandleader and trombonist of the swing era. Some of their accolades include a discography of over 40 albums, performances and recordings with stars like Dizzy Gillespie, Doc Severinsen, and Nancy Wilson, commissioned works from top composers such as Bob Florence, Bob Mintzer, and Sammy Nestico, and reaching the #2 spot in the JazzWeek jazz chart for their holiday recording of “Cool Yule.” The Airmen of Note will perform not only Friday night after Grace Kelly & The New York Voices, but also Saturday at the 4pm awards concert. Throughout the Eau Claire Jazz Festival, you can check out Student Performances throughout Friday and Saturday, where student combos and big bands will compete for various accolades and prizes including the chance to play on the headline concerts or even win a free instrument for their school. 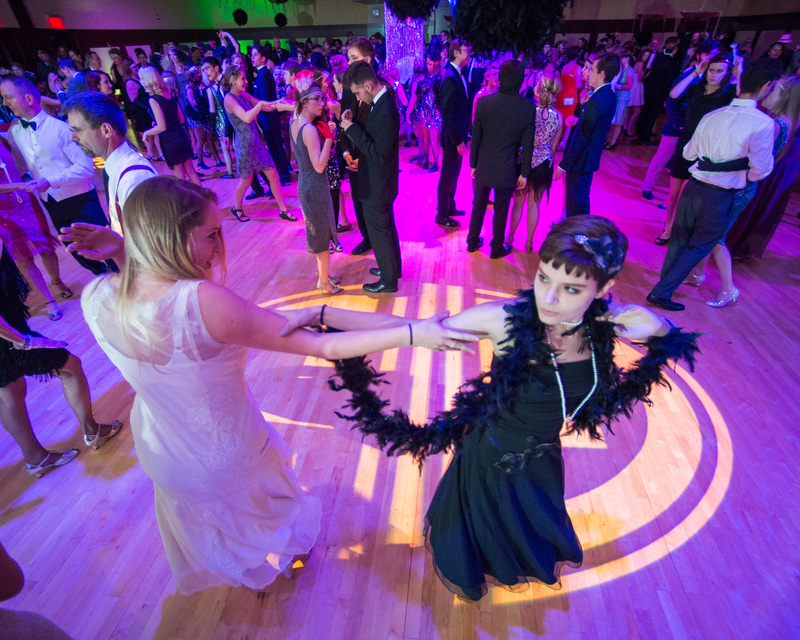 The Gatsby Gala event lets you step back to the roaring '20s where you'll be surrounded by the sights and sounds of the era! The UW-Eau Claire Jazz I and Jazz II ensembles will perform with special guest artists throughout the night. Expect to hear non-stop music including all your favorite classics from the swing era and even charts with a modern take on the style. Come dressed in your favorite 1920's-inspired black-tie attire and get ready to party! Tickets are separately purchased for this event and can be secured here. Also Friday night, the Eau Claire Jazz Festival sees downtown Eau Claire transform into a recreation of the historic 52nd street in New York City, a location infamous for its prevalence of jazz clubs and wealth of talent. Over twenty performance venues host concerts all evening long! As you can tell, there are quite a few reason to check this out. It all happens in the new Pablo Center at the Confluence in downtown Eau Claire, a venue that just opened in Fall 2018 with a 1,200-seat main theater, an adjacent 400-seat theater, and other public and event spaces. Definitely a cool new place to check out as you enjoy great music and everything else Eau Claire has to offer! Pablo Center at the Confluence 128 Graham Avenue Eau Claire, WI 54701 (715) 836-4092 Website Twitter: @ECJazzFest You can get to Eau Claire via I-94, U.S. 12, U.S. 53, or Highways 37, 93, or 124. Get ticket details, a complete schedule, and more on the Eau Claire Jazzfest website.